The Figure above compares the number of researchers in major research-intensive world regions or countries. In 2006, there were 1.33 million researchers in EU-27, 1.39 million in the US and 1.22 million in China. 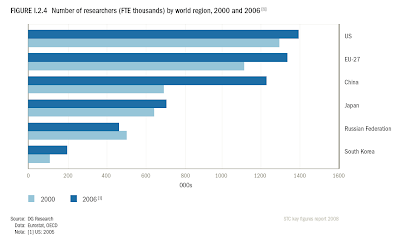 Strong increases in the number of researchers have been observed from 2000 to 2006 in China (+9.9 % per annum) and South Korea (+10.8 % per annum), compared to EU-27 (+3.1 % per annum), Japan (+1.5 % per annum) and US (+1.5 % per annum). The number of researchers has grown on average twice as fast in the EU as in the US and Japan since 2000. 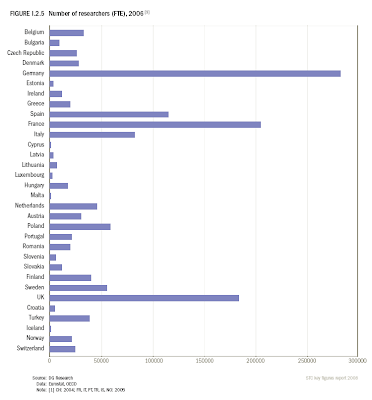 The Figure above compares the number of researchers in EU-27 Members. 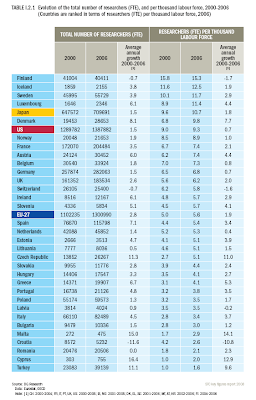 It illustrates that in EU-27, the three biggest countries – Germany (282,063), France (204,484) and the United Kingdom (183,534) – account for half of the researchers. The Figure above shows the evolution of the total number of researchers and its per thousand labour force representation in EU-27. Within EU-27, the number of researchers has increased in all Member States over recent years. The strongest average annual growth rates have been observed in Malta, Cyprus, the Czech Republic and Denmark (more than 8 % per annum) . The EU remains less researcher-intensive than the US and Japan. In 2006, the number of researchers per thousand labour force was 5.6 in EU-27, compared to 10.7 in Japan and 9.3 in the US. Within the ERA, the share of researchers in the labour force is highest in Finland (15.3 researchers per thousand labour force), Iceland (12.5), Sweden (11.7) and Luxembourg (11.4). The number of researchers per thousand labour force is lower than 5 in 11 EU Member States, as well as in Turkey and Croatia. EU-27 experienced an increase in the number of researchers per thousand labour force, from 5 in 2000 to 5.6 in 2006, which corresponds to an average annual growth rate of 1.9 %. In comparison, the US and Japan have had average annual increases of 0.7 % (from 8.96 to 9.27) and 1.8 % (from 9.57 to 10.66) respectively over the same period. Many ERA countries had significant growth in the number of researchers per thousand labour force, in particular the Czech Republic, Denmark and Turkey.